JGB Enterprises, Inc. was approached with a concept for charging electronic jamming pods with N2 gas. 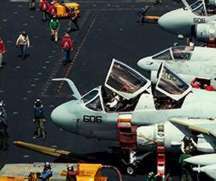 Electronic jamming pods used on the Navy's AE-6 Prowler aircraft require charging with N2 gas to augment electric circuit insulation. From the original concept, JGB Enterprises, Inc. designed, developed, tested, demonstrated, specified, manufactured, delivered, and continues to support the XMTR Pressurization Set.